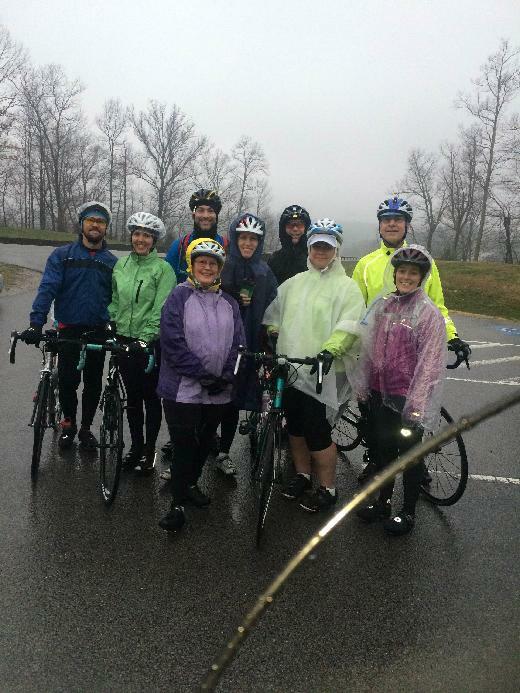 A cold and rainy early morning ride with Team In Training on The Natchez Trace Parkway. It was slow going with the wind and the rain but we did accomplish several climbs on a the mile hill but were only able to log 22.7 miles due to the weather. We were inspired by Keeley's account of the young girl who lost her fight with leukemia and reminded how many people are impacted by leukemia and lymphoma. Jon reminded us that the cold rain was a mild obstacle compared to the struggles of the young Knoxville woman who was transferred to Vanderbilt. Cold feet and hands are nothing compared to the problems facing those battling against leukemia and lymphoma. Please consider a donation to my 100 mile ride to help find cures for leukemia and lymphoma. Team In Training's Cycle Team is jointly raising funds and awareness in the fight against blood cancer, as we train weekly for their 100 Mile (Century) Rides in June. We must be crazy! We thought so too, and call ourselves Team Wheel Crazy! Admission processed on this page will be credited towards our Team as a whole. 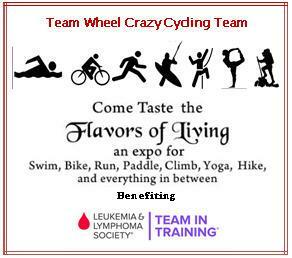 Together, Team Wheel Crazyis raising nearly $40,000 by late May! This event is a significant source of that goal. Without reaching our individual goals, we aren't able to attend the Rides we're training for, and it's all in the name of Blood Cancer. Nashville's Independent Radio, Lightning 100 (WRLT 100.1 FM) will be broadcasting from this event live, featuring DJ Lt. Dan Buckley! Stop by the Lightning 100 table to purchase Lightning 100 merchandise, request songs, and share your stories connecting you to the mission of The Leukemia & Lymphoma Society. Bring your kidos for only $1 admission per kid under 16 years old, and let them hang out in the KID ZONE! There will be crafts, active living demonstrations geared towards kids (bike safety, how to help your parents pack for camping, how to inflate a bike tire), and story time. Kids can earn bicycle charms for participating in the KID ZONE acitivies. The more activities they do, the more charms they get!